Sweater weather is upon us! These crisp days give us the urge to hit the road, whether for a day or for a night out under the stars at one of our favorite state parks! Of course we've got to take along a few of our favorite outdoorsy items from the shop. New to us is the Highway to the NATURE Zone journal, with cool factoids for checking out nature in every state! You may see our Indiana State Parks Sticker on the bumper (or camper) as we head away from the city. Our lithograph compass necklace will always remind us of our explorations, while the red plaid canvas flask can provide a little extra sass to our coffee, tea or cider - perfect for post-hike relaxation around the campfire! We've got fun postcards to send back home so folks know we are thinking of them, and a lovely Rifle Paper Co pen to write them with! 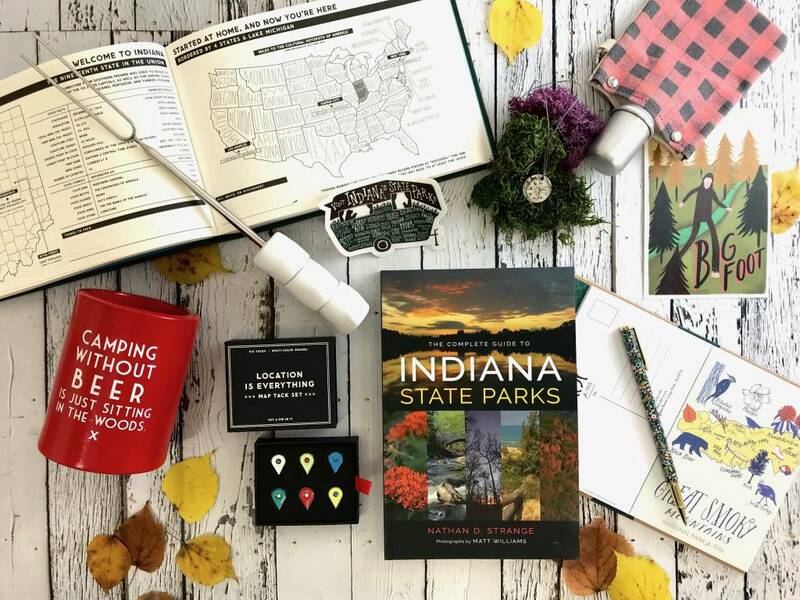 The complete Indiana State Parks guide book will helps discover new favorites and our Location Tack Kit will mark our latest destination on the map in our office. Finally, a campy can cooler to keep our cans cold and our hands not-cold (we suggest cans of Ash & Elms Sunset Tart Cherry or Autumntide to those who choose to imbibe) and our Toasty expandable roasting forks for whatever it is you like to cook over the fire - smoking goose sausage? ball park franks? peppers and portobellos? Check out our Campout Cookbook (not pictured) for some fun ideas! Wherever you are headed, unplug, be safe and leave it better than you found it! Cheers!